Last week was a tough week for me. The problems I had at home left me crying, I was in dilemma, I didn’t know what to do. Then I thought I needed to call my mother to ease my pain, and so I did. We talked for about 40 mins and I was wailing like a little child on the phone. Before the call ended, my mother never failed to make me feel better. I have experienced this so many times already. When I wouldn’t know what to do, I turn to my mother and tell her everything and I feel a lot better. So even if we’re apart, she’s one of the few people I turn to when I need emotional lift. I remember when I went home, we would just talk about our lives and we’d sometimes cry because of what life has brought to us (all the difficulties we experienced and how we’re able to get through it with God’s help). My mother is one of the people that God uses to comfort me and lift me up. I remember we had a huge fight when I was still in High School, she cried right in front of me because I was being hardheaded on her. At that time, I have to admit, “di ako naawa sa kanya”, it was more of “baduy” for me to see her crying and I knew back then I wanted to apologize but I didn’t say sorry. That’s one of the things I regret in life now that I’m away. Now that I have a child of my own, I’d always tell my mother: “now I understand how difficult it is to raise a child, thank you so much for taking care of us and I’m sorry for being a headache before”. Sometimes, I would say this to her as a joke, but I mean it. I am so grateful for my parents. But at the same time, I was reminded that I should not just call them when I needed help. I should constantly call them (my family in Tagum) just to check on them and see how they’re doing. Now that they couldn’t go online that much anymore, my way to contact them is through phone. 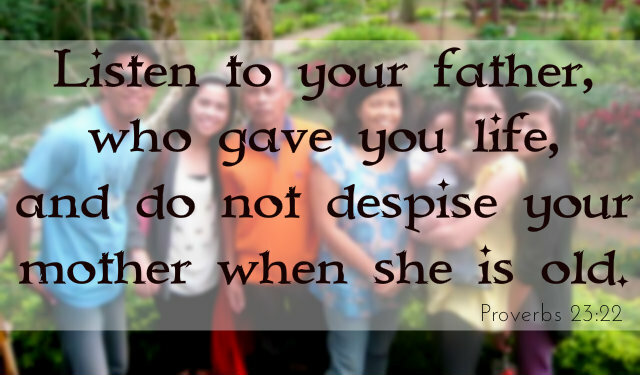 Sometimes, we get too busy with our lives that we sometimes neglect checking to see how our parents do. For those who are living away from their parents like me, maybe now’s the time to call them again, I’m sure they’d be delighted to hear about you and how you’re doing. For those who live near them (or with them), it’s an opportunity to always show and tell them how much you love them. Lucky you sis that you can turn to your mother when you are feeling down. I used to do that too when my mother can still understand what I am talking about. But now that she can understand a little, I content myself by just looking at her. Her laughter always warm my heart. Makita ko lang na di sya nahihirapan is more than enough for me. I love her so much.